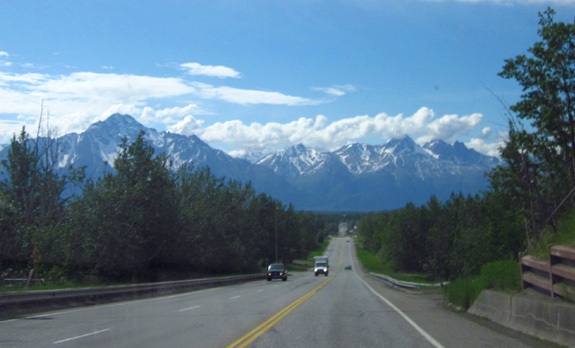 was Anchorage's only connecting road to the rest of the state and the Lower 48." We have now driven all of the Glenn Highway between Tok and Mile 0 in Anchorage, although we did it in two legs over four different days -- Tok to Glennallen on our way to Valdez, and now Glennallen to Anchorage. Today was our shortest travel day since beginning our Alaskan adventure back in May. 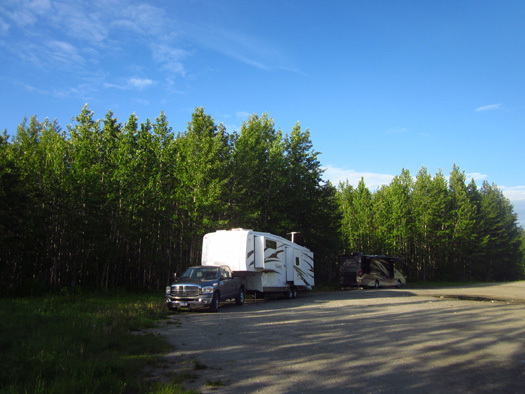 The distance from our overnight stop at a turnout near Sutton-Alpine and along the Matanuska River to the northern part of Anchorage (the Black Spruce Campground at Fort Richardson) was just 53 miles. Where the Cameo started this morning . . . It was great! We like days like this and will be incorporating more of them into our travel plans as we explore Alaska. You'd think that wouldn't take much more than an hour on the paved Glenn Highway but our stop to tour the Musk Ox Farm near Palmer this morning turned the trip into several hours. We arrived at our campground at lunch time and had the whole afternoon to begin exploring the base and Anchorage.
. . . Where the Cameo ended this afternoon. I wrote about the interesting musk ox farm tour in the last entry. 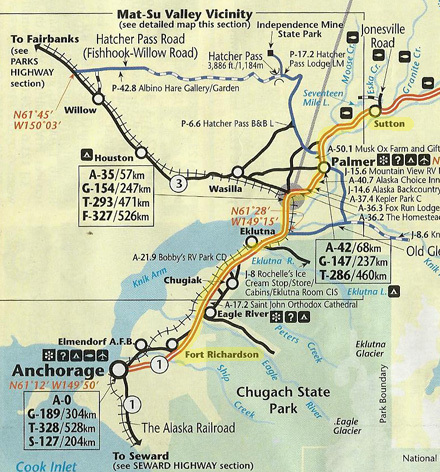 This page describes our route on the Glenn Highway from MM 63 to MM 8, the northern-most entrance (Richardson Gate) to Joint Base Elmendorf-Richardson (JBER). The information may be helpful to other travelers whether they are traveling in an RV, passenger vehicle, or motorcycle. The roads were pretty good today between MM 63 and MM 0, with no construction. I'll be referring to several locations on that map in this entry. The weather was great today � some clouds but mostly sunny and up to 70 F. in Anchorage this afternoon. Perfect! At MM 49 we passed the junction with Palmer-Fishhook Road, which leads north to Hatcher Pass Road and Independence Mine State Historic Park. That's another destination on my list sometime this summer. We drove through the southern part of Palmer but didn't stop anywhere. We passed the fairgrounds where the Alaska State Fair is held in late August-early September. 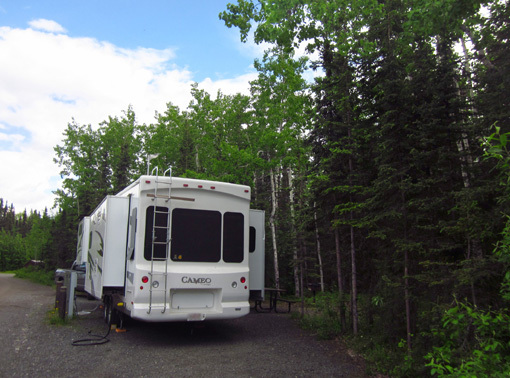 We'll either camp in the Palmer-Wasilla area for a few days later this summer or visit the places we want to see in the Mat-Su Valley on one or more day trips from Anchorage. Traffic was moderate on the two- and three-lane sections of the Glenn Hwy., then rather heavy as we turned to the south at MM 36 and approached Anchorage on a four-lane divided freeway with ramps and limited access. We haven�t been on a real freeway for a couple of weeks, let alone in a big city. Anchorage may have �only� 300,000 people but it feels big as long as we�ve been in remote territory with much smaller towns and cities. We have decent maps of the city and a GPS unit so we shouldn�t have any trouble getting around town. The prices we saw today for diesel were $4.26-29/gallon in Palmer but less in Anchorage. It�s $4.19 on base (both Elmendorf and Richardson). I saw prices of $4.19 to $4.26 in the city as we drove around this afternoon. View of the Chugach Mtns. going south on the Glenn Hwy. toward Anchorage. The two peaks that are close together to the right of the glacier are called Twin Peaks. 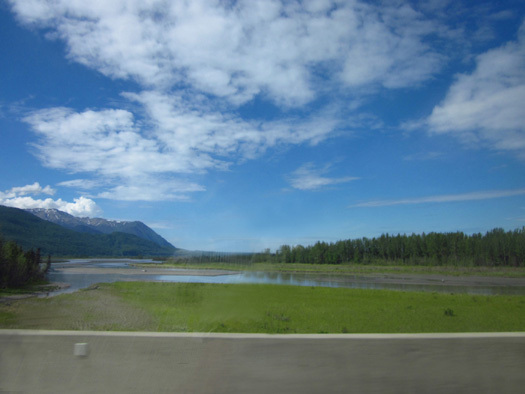 We crossed the very wide Matanuska River at MM 31.5 and the Knik River a mile later. 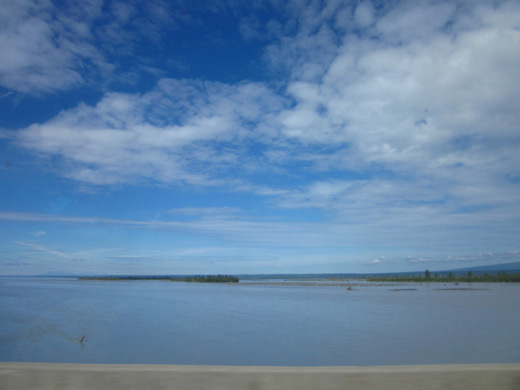 Each river has braided (multiple) channels as it flows toward Knik Arm. We'd been following the Matanuska River from its source at the Matanuska Glacier. The Knik River comes down from the Knik Glacier. We could see part of the Knik Glacier from the highway but I didn't get a good picture of it. I could see numerous birds as we drove through the wetlands. They provide a major migratory route in the spring and fall and are the most heavily-utilized waterfowl hunting area in Alaska. There are several access sites to the estuary. Moose winter in this area. The cows and calves can be seen in the early morning and evening until early July. Then they head to higher, cooler terrain nearby until autumn. We passed through the area about noon and didn't spot any moose. We know they are there, though. At the intersection with the George Parks Highway (goes north to Fairbanks) there was a sign that said 455 moose had been killed by vehicles but I don�t know the time period and if it was just in that area. 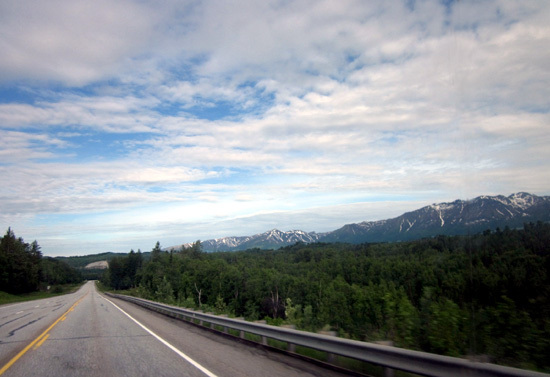 The highway crosses a protected wildflower area called the Eklutna Flats around MM 27. From the highway I could see some very pretty wild blue irises that looked like the Japanese irises in our garden in Virginia. There is a one-mile trail around Reflections Lake near MM 30 that I'd like to explore while we're in the area. Some of the same flowers we saw blooming in Valdez also bloom here in June, including shooting stars, chocolate lilies, wild roses . . . and dandelions, of course! 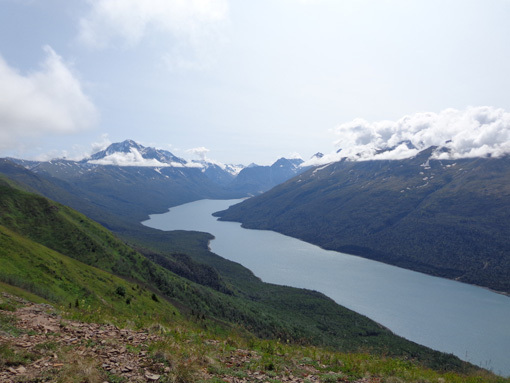 The Eklutna area has several places we'd like to visit sometime this summer, including Eklutna Lake Recreation Area in the humongous Chugach State Park. 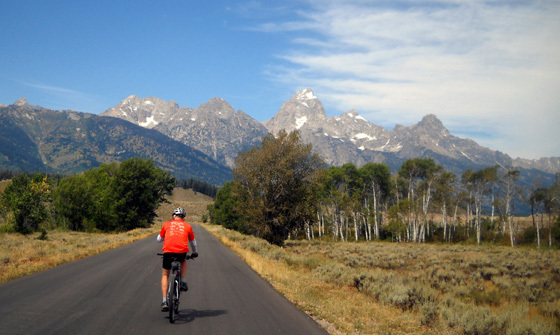 We're interested in several hiking and biking trails there. Thunderbird Falls is nearby, as well as an historic park with an old Russian Orthodox church and unique cemetery with colorful "spirit houses." 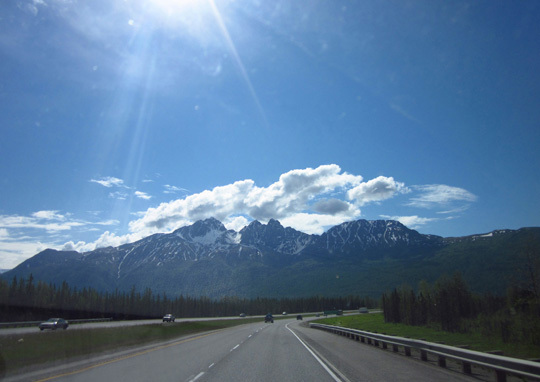 Those can be day trips from Anchorage, since they are only half an hour from our campground at JBER (off the Glenn Hwy. at MMs 25-26). entry after the trip was over, I'm using this picture from a hike later in the summer). We passed Eagle River (a river and community named after it) at approximately MM 13. Like the Matanuska and Knik rivers, the Eagle River is a glacial stream originating in the Chugach Mountains northeast of Anchorage. 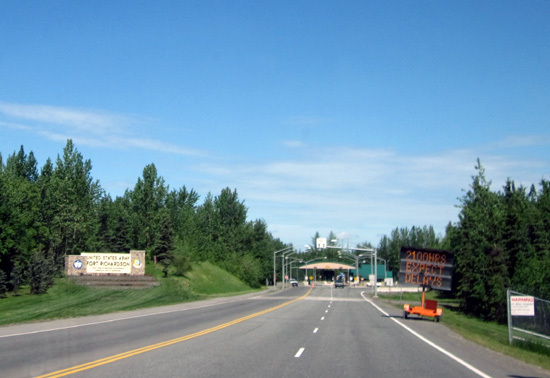 A once-rural area that was originally homesteaded after WWII, the town of Eagle River is now a fast-growing residential and business area that is almost a suburb of Anchorage now. 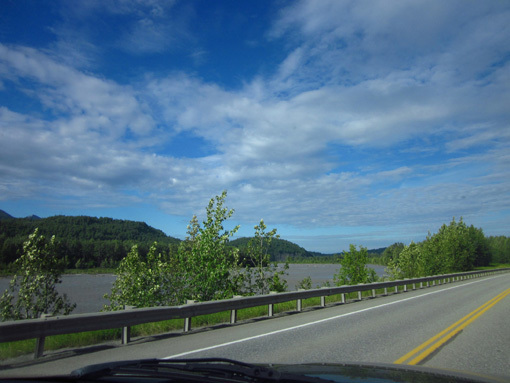 While we're in the area I'd like to visit the Eagle River Nature Center and explore some of the trails along and above the two branches of the river that flow down into Knik Arm. The most famous trail in the area is the Crow Pass Trail which crosses the Chugach Mountains for 24 miles from Girdwood to Eagle River. There may be too much snow now to get to the pass but I'd like to hike part of the trail out-and-back from the Eagle River end of it. A point-to-point foot race is held on the trail annually in July but the time limit is too strict for me to walk it (I'm not supposed to be running any more). Around MM 11 we could see a bike path next to the southwest-bound side of the freeway. It kept going to (and past) our exit at MM 8. I doubt we'll ride there, though. There are enough miles to ride at JBER and on other bike paths in the city that should be more interesting than right along the freeway. Anchorage probably has more miles of bike paths and trails than any other U.S. city of its size. The exit at MM 8 leads west into Fort Richardson, home of the "Arctic Warriors." You don't have to be active or retired military to enter the post but you do need a driver's license, current vehicle registration or rental agreement, and proof of insurance if you want to drive around on post or visit the National Cemetery near that entrance. This the the northernmost of several gates into the sprawling Joint Base Elmendorf-Richardson (JBER). To the east is a frontage road that connects to Arctic Valley Drive, which is accessed at MM 6 if you're going northbound on the Glenn Highway. Arctic Valley Drive leads about seven miles up into Chugach State Park to a ski area and lots of alpine trails. Hiking to Rendezvous Peak is one of my objectives this week. The Milepost reports that the panoramic views from the top are spectacular. So many things to do in this area and I haven't even begun to list what we'd like to do in the city proper while we're here . . .